This is a guest post by Mustaasam Saleem from Cloudways. When you have a WordPress website, you have to upload files every now and then to keep your site active and pretty. So you need to know that there is more than one way to upload your picture, theme, or any other content to your WordPress. Log in to your hosting provider by accessing their online file manager. Connect to your server via an FTP client like FileZilla. Upload your media, themes, or plugin files directly from the WordPress Dashboard. If you want to upload anything other than media, themes or plugins, you can always upload them via a file manager. However, for all normal uploads, simply navigate to your desired location within the WordPress Dashboard and choose add/upload file. Did you notice something weird, though? No, not in the article. In the screenshot above. Yes, the maximum upload file limit of just 5MB. Isn’t this off-putting? And this limit also applies when you want to upload a theme or plugin directly from the WordPress Admin Dashboard. This threshold varies from hosting to hosting though. Some even allow only 2MB by default while others may allow more. Don’t worry though; we’re here to tell you exactly how to increase the upload limit. Let’s get started without further ado. Slow site kill sales! Supercharge your WordPress speed with these 8 hacks. This defines the maximum upload limit for files. This defines the maximum upload limit that will be handled in a POST request. This defines how much memory is allocated for PHP. This number should be equal or higher than the upload_max_filesize. Let’s assume we have a 20MB file. We’ll set the upload_max_filesize to 25MB, post_max_filesize to 27MB, and memory_limit to 30MB. Here are the steps you can take to increase the upload limit. Depending on your server, any one of them should work. Please make sure to create a backup file before making any changes. PHP.ini contains the PHP configuration for your server. You can find it in the root directory of your server. Go to your hosting root directory and search for php.ini file. Due to security reasons, it might be hidden, so don’t forget to check “Show hidden files”. File size to be uploaded: 20MB. If you didn’t find the php.ini file, don’t worry! You can create it with a Right Click of your mouse and selecting Add New File. Open the new file and paste the three lines above and save it as php.ini. Sometimes your server’s php.ini file is named as php5.ini, hence, don’t get confused between the two. .htaccess is an important file and contains various configurations for your server. Most hosting providers keep it hidden though. To modify it, you need to check “Show Hidden Files” once again and locate .htaccess file within the root directory of your server. If the above two methods didn’t work for you, there is always an alternative. You can paste the following 3 lines within your WordPress files. These lines can be written in wp-config.php, themes functions.php file etc. However, this is not the recommended way to increase upload file size limit. Go to Servers from the bar on the top and get into your desired server. Select Settings & Packages from the left pane and you’ll see Upload Size under basic settings tab. Change it to your requirement. In our case, we’ll use 25MB. If you don’t want to do it manually, there is always a plugin in the WordPress repository. You just need to find the right plugin that is compatible with your current WordPress version. Try using Increase Upload Max Filesize which is compatible with the latest version of WordPress. From the left pane of your WordPress Dashboard, navigate to Plugins -> Add New, search for the Increase Upload Max Filesize plugin from the top right corner, and Install it. 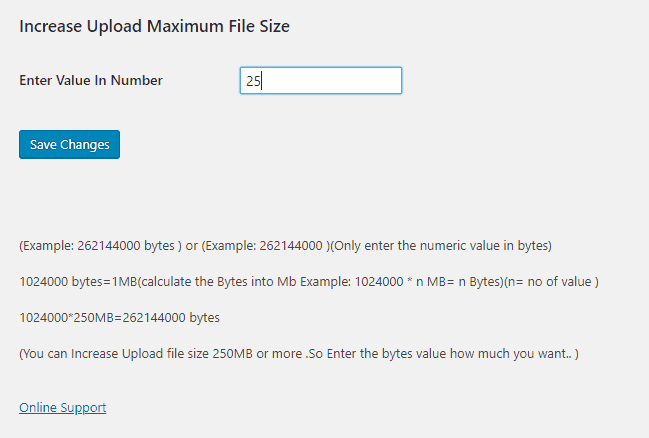 Once the plugin is activated; navigate to its settings and enter the desired size for your new upload size. That’s it! You have just increased the WordPress Maximum Upload File Size Limit. If nothing else works, simply ask your hosting provider to increase the file size upload limit on your WordPress application and they’ll surely help you out. Cloudways 24×7 support is highly responsive and you’ll be able to work your way towards your goal within no time. If you know any other means to increase the file upload size limit, feel free to share it by using the comment section below. Also, let us know which option worked perfectly for your WordPress application! Mustaasam Saleem is the WordPress Community Manager at Cloudways (A Managed WordPress Hosting Cloud Platform). He actively shares what he knows about WordPress in the Community. When he is not working behind his computer screen, you can find him playing squash with his friends. Connect with Mustaasam via @MustaasamSaleem.